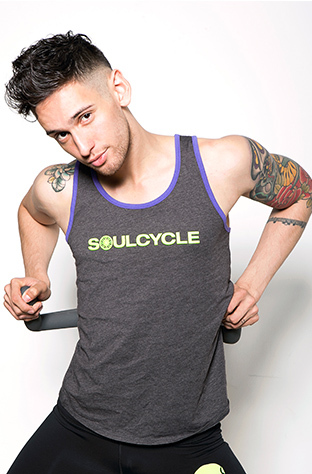 My first ride at SoulCycle was with Danny in Union Square on a Saturday afternoon. I went with a friend who worked at the front desk and she put me front and center! In my head I thought, "How hard could this be?" Well about two minutes into it, I figured out it was REALLY HARD! I fell in love with SoulCycle because nothing else had ever challenged me like that mentally or physically. SoulCycle opened up doors for me that I didn't even know existed. If you let it, that little dark room can really change your life. I started riding at SoulCycle in 2009; a friend of mine started working at the front desk and all she could say was, "You have to try it. It's life changing. Come try a class with Melanie Griffith"
My first few classes were like the norm. Awkward at first, a little timid adding resistance and feeling like Bambi learning how to walk. Once I got the hang of it, I routinely rode with Ayana, Kym, Stacey, Jenny, Melanie and Christine! They all brought something different to the table and have brought out all different sides of me! If I wanted cheering up, I go take Stacey. Needed to feel? Melanie. To laugh and dance? Ayana. I started working for SoulCycle in NYC and the Hamptons part-time shortly thereafter. I knew I was addicted… but it was always something more. It was in a night class with Melanie. She shared with us what her subway conductor reminded the subway riders that morning: "Choose to have a good day." BOOM. I literally remember looking up at Mel on the podium ready to fly off that bike with a lump in my throat. That's was all I needed to hear to recognize that I had control of my life. I no longer wanted past relationships, college struggles and stress or the pressure of society to define me and my days. Four years later, I have grown up with Soul and honestly, I could never imagine my life to be what it is today without SoulCycle. Now I am sharing the love I have for Soul, spreading that idea of self control with the community and allowing myself to keep blossoming and taking risks! My very first ride was with the incomparable Danny Kopel. I remember being totally anxious and frazzled, especially trying to clip in. (I was that rider whose foot turned into a flopping fish, until the front desk rockstar helping me finally just grabbed my foot and guided me in). But then! The lights went down, and from the first beat I was transfixed and transcended by the journey, in total awe of this impish, articulate, radiant force that was (and is) Danny Kopel, and I just had the best darn time! I went home that night and couldn't stop talking about it. Hooked. Forever in love. My very first ride was with my best friend, Kimberly. She lived in Brooklyn and I was living in Queens, so Union Square was a midway point for us. One day, Kimberly, who was working for lululemon, mentioned that she had taken a class with Madison and she thought I would really love it. At this point, I was working three jobs and auditioning every single day. I didn't have a ton of time to spare and I wasn't really looking forward to spending 45 minutes of my precious "alone" time on a bike sweating it out. Kimberly, being the convincing little devil that she is, talked me into it and all of a sudden I found myself on a back row bike attempting to walk and ride in my clippy cloppy shoes. Although most of the ride was a blur, I distinctly remember sobbing my eyes out to Jessie Ware's "Wildest Moments" and knowing then and there that I would be back for more. The interesting thing about it is that for the three months that I rode in New York (before I moved to LA), I never left the back row and I never once told Madison how much she changed my life for the better. So, Madison, thank you, thank you, thank you… from a back row rider turned instructor. My first ride was on a Saturday morning in TriBeCa with Marvin. I rode in the back corner on bike 39 with my friend (Soul instructor Ryan Foley!) next to me. He convinced me to come to the class because I had hurt my knee running and he explained how indoor cycling has much less impact on the joints. Within the first set of tapbacks, I was hooked. I loved watching the room move together, the energy of the dark candlelit studio, and the music. I was a dancer growing up and hadn't danced in forever so it felt like I was able to combine everything I used to do. Marvin still teases me because I unclipped by accident twice during my first class! What hooked me later was when Marvin had asked me to consider being an instructor. It was right before Hurricane Sandy and when the storm hit, I was displaced from my East Village apartment. The restaurant that I was working in was closed for the week with no power. I was staying with a friend of mine who rides at the West 77th Street studio and he asked if I wanted to go take class. Since it was the only sense of normalcy I had, I said "yeah!" It was my first time going without asking Ryan to set me up (he still texted me my bike settings). It was one of the few studios open during the storm so the classes were crazy busy and the studio staff was holding it down so well. It was Lori A. 's class. She taught off the bike and put two strong riders on the podium to help get more riders into class and we finished class with "Spectrum" by Florence and the Machine. I think it was the Calvin Harris remix and I just remember that during all of the chaos of the storm, I felt like I was home. The rest is history. What made me fall in love with SoulCycle had to be the room. The spirit and energy of it was an experience that I eventually became hooked on. I devoted myself to always bringing the energy to the room whether riding or teaching. My first SoulCycle class was with Gina Heekin in West Hollywood. We had worked together before she left for training in New York so I was so excited to see her when she got back! I knew SoulCycle was going to be completely different from the indoor cycling classes I had taken before but I had no idea how empowering, motivating and truly life-changing those 45 minutes would be. She welcomed me into the community with enthusiasm and a sense of gratitude that I still hold onto in every class I teach today. After class, as I went up to the podium to give her a sweaty hug, she immediately asked, "So when are you auditioning?" Still reeling from learning all of the new choreography, I was surprised that she thought I was ready to audition, but she made me feel like SoulCycle would be there for me whenever I was ready to give it a shot. 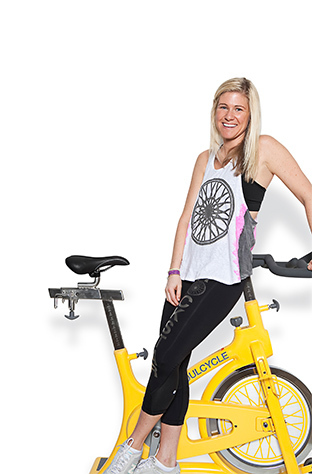 After my first class at SoulCycle, I felt an immense sense of belonging and I couldn't stay away. I started crushing as many classes as I could and just a few short months later, I was auditioning in West Hollywood. The energy that Gina brings to that room has always been such an inspiration for me and I'll never forget the class that put me on my new path. From the bottom of my heart, thank you, Gina. My first class was at the original SoulCycle in NYC. It was a small room in the rear lobby of building on West 72nd Street with one tiny hallway that led you to a dark candlelit room. I was dancing and sweating and even shed a tear or two. I walked out knowing that I'd found something special and that I needed to be a part of it! 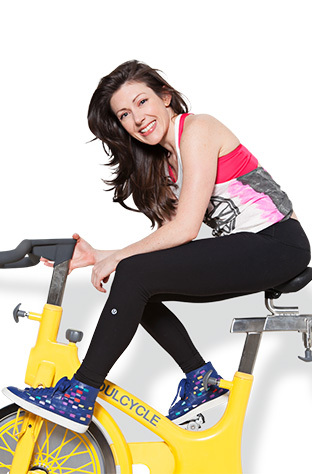 Kym Perfetto (of SoulCycle LA and the Amazing Race!) was one of my first instructors! I was so inspired by her athleticism, authenticity, and rockstar personality that I kept coming back! 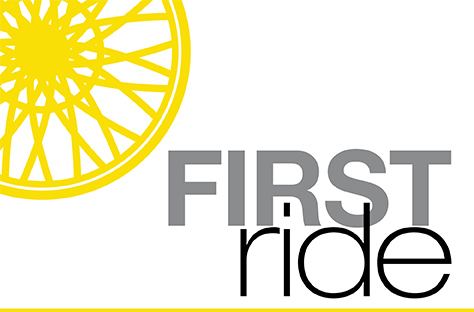 My first ride was in the fall of 2012 at SoulCycle Union Square. Having an extensive dance and fitness background, I honestly thought class would be a breeze, so I confidently parked myself if the front row of Jenny's class. Needless to say, it took less than a minute for me to realize that SoulCycle was unlike anything I had done before, and yet I was hooked. I fell in love with everything — the atmosphere, the MUSIC, the candles, the gear, the sweat. It was clear to me that SoulCycle was a special place. Every time I walked out of the studio door, I felt like I was walking on a cloud of happiness and good vibes, and all I wanted to do was turn around and go right back in for more. My first ride at SOUL was July 4, 2012 at the West Hollywood studio with Ben Bruker. I was down in LA for the holiday and my best friend had just started to get hooked on Soul so she suggested we sneak a ride in that morning before we commenced with our patriotic celebrations. We sat in the very back row, I didn't understand a thing that was going on, and I don't think I was able to find the rhythm once, but the music was amazing, Ben was so fun, and I had the biggest grin the whole time. I left and immediately started my own personal Twitter campaign to get SoulCycle to the Bay Area. Spoiler alert — it worked! Okay, maybe the Bay Area studios had been part of the plan all along, but I like to think my incessant pleas had something to do with it. Either way, the Marin studio opened in June 2013 and I never looked back. I fell in love with Soul, thanks to Jenny, Ian, Allie, and Lauren. They pushed me to be stronger and gave me the opportunity to be myself. If you haven't tried it before, just give it a chance, you never know where a stationary bike in a dark room can take you. My first ride was before the San Francisco studio opened — I was in Santa Monica for a work trip and happened to be staying at The Huntley, which is a block from the Santa Monica studio. My first class was with the incredible Laura Crago — I sat second row center and was mesmerized by the experience. The dark room, the music, the energy — I'm a dancer and it was the first time I'd ever been as inspired as I am in dance class. When I clipped in and started peddling, I felt like I was there for a reason.